A Farewell to Arms (1929) by Ernest Miller Hemingway was one of the books I read in my undergraduate years, and, like many writers before me, the book had a deep impact on me to become a writer. At the time of my first reading of this novel, I was twenty or twenty-one and by the time I reached the end of the book I was in tears. My tears came at not only the story’s finale but in Hemingway’s subtle ability to tell such a simple story so damn well. Now I am thirty-four, and by the time I came to the end I was not in tears (perhaps I have grown too cynical in the last decade) but I still admire much the same things I did on my first reading. ”I did not say anything. I was always embarrassed by the words sacred, glorious, and sacrifice and the expression in vain. We had heard them, sometimes standing in the rain almost out of earshot, so that only the shouted words came through, and had read them, on proclamations that were slapped up by bill posters over other proclamations, now for a long time, and I had seen nothing sacred, and the things that were glorious had no glory and the sacrifices were like the stockyards at Chicago if nothing was done with the meat except to bury it. There were many words that you could not stand to hear and finally only the names of places had dignity… Abstract words such as glory, honor, courage, or hallow were obscene beside the concrete names of villages, the numbers of roads, the names of rivers, the numbers of regiments and the dates” (p 165). ”Often a man wishes to be alone and a girl wishes to be alone too and if they love each other they are jealous of that in each other, but I can truly say we never felt that. We could feel alone when we were together, alone against the others. It has only happened to me like that once. I have been alone while I was with many girls and that is the way that you can be most lonely. But we were never lonely and never afraid when we were together… If people bring so much courage to this world the world has to kill them to break them, so of course it kills them. The world breaks every one and afterward many are strong at the broken places. But those that will not break it kills. It kills the very good and the very gentle and the very brave impartially. If you are none of these you can be sure it will kill you too but there will be no special hurry” (p 222). ”I got out and walked ahead, going between the trucks and carts and under the wet necks of the horses. The block was farther ahead. I left the road, crossed the ditch on a footboard and walked along the field beyond the ditch” (p 173). The writing is dry, simplistic, and contains constant momentum for the characters. In other words, in 1929, Hemingway wrote realism, which is just as popular today as it was then. 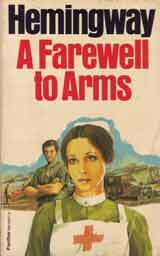 A Farewell to Arms is comprised of five sections. Section I: the main character, Lieutenant Frederic Henry, is an American fighting with the Italians as an ambulance driver when he meets the English, and sometimes described Scottish, Catherine Barkley, who is a nurse also on the Italian Front during World War I. Henry becomes injured when a bomb explodes while he is eating with his comrades. As Henry is eating a piece of cheese and drinking some wine, the dugout is hit: ”I tried to breathe but my breath would not come and I felt myself rush bodily out of myself and out and out and out and all the time bodily in the wind. I went out swiftly, all of myself, and I knew I was dead and that it had been a mistake to think you just died. Then I floated, and instead of going on I felt myself slide back. I breathed and I was back” (p 51). Henry is rushed to surgery and is eventually sent by train to Milan to recover from his wounds. Section II: Catherine transfers to the hospital in Milan to be near her love, Henry, who is recuperating. They have a grand love affair over the summer. ”I loved to take her hair down and she sat on the bed and kept very still, except suddenly she would dip down to kiss me while I was doing it, and I would take out the pins and lay them on the sheet and it would be loose and I would watch her while she kept very still and then take out the last two pins and it would all come down and she would drop her head and we would both be inside of it, and it was the feeling of inside a tent or behind a falls…We would be lying together and I would touch her cheeks and forehead and under her eyes and her chin and throat with the tips of my fingers and say, ‘Smooth as piano keys,’ and she would stroke my chin with her fingers and say, ‘Smooth as emery paper and very hard on piano keys’ (p 102-103). Henry has another surgery and does routines for rehabilitation on machines (more on this can be found in Hemingway’s short story called ”In Another Country”). 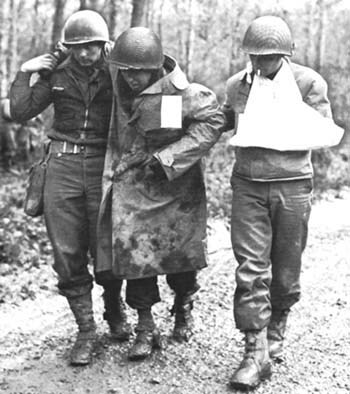 Later, Henry fully recovers and he is sent back to the front. Section III: Henry is at the front when the Italian army is defeated at the Battle of Caporetto and a retreat is ordered. Henry with companions flee from the invading German/Austrian army. 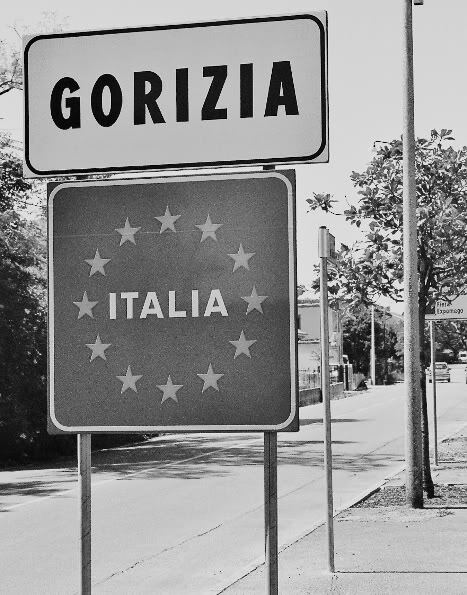 ”We came into Gorizia in the middle of the next day. The rain had stopped and the town was nearly empty. As we came up the street they were loading girls from the soldiers’ whorehouse into a truck. There were seven girls and they had on their hats and coats and carried small suitcases. Two of them were crying. Of the others one smiled at us and put out her tongue and fluttered it up and down. She had thick full lips and black eyes” (p 168). Down the road, Italian officials are to blame for the defeat and are being shot. Since Henry is a Lieutenant he is pulled aside by the ”battle police” to be asked questions, along with several others, and then executed. Henry thinks quickly and makes a rush for the river and escapes. Eventually he makes his way back to Milan and tracks Catherine, who is now pregnant, at Stresa. Section IV: Henry finds Catherine in Stresa and they have a few romantic days of bliss in the hotel before they row to Switzerland, which lies across the lake, and escape the war. I did not saying anything. ‘Good,’ I said, ‘that’s what I want too”’ (p 270). As Catherine’s pregnancy draws to an end, Henry and Catherine decide to travel to Montreux to be near a hospital. There they take a reprieve. ”Catherine bought the things she needed for the baby, up in the town. I went to a gymnasium in the arcade to box for exercise. I usually went up there in the morning while Catherine stayed late in bed. On the days of false spring it was very nice, after boxing and taking a shower, to walk along the streets smelling the spring in the air and stop at a cafe to sit and watch people and read the paper and drink vermouth; then go down to the hotel and have lunch with Catherine” (p 275). The ending to A Farewell to Arms is one of those endings that haunts you long after you have read it. For me, it has stayed with me for about a dozen years, and the end will continue with me into my old age. The impact on me emotionally, however and interestingly enough, was disparate and of a new sensation. On this reading, unlike the first time, I did not cry. I felt much the way Henry did as he walked back to the hotel in the rain. A Farewell to Arms, for me, will always be a special book. Its memories have become my memories. Even if I return to it a different man. This book is a strong recommend not because of Hemingway, but because of a story told so well it lasts. If Ernest Hemingway were Alice today he’d approve of this review, although had he written it, it would have been much shorter. Great piece of writing on a on a great masterpiece. Hi there, after reading this amazing post i am as well happy to share my knowledge here with friends.